Are you ready to self publish your book? The barriers that have prevented an author from seeing his/her book published have vanished. No longer do authors need to send out countless query letters to publishers, who either dump them in the trash, or send a standard, cold rejection letter. Now you can take control of your publishing career. 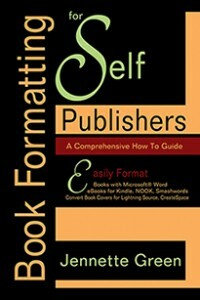 With Book Formatting for Self Publishers, you will learn how to use simple techniques to produce a professional looking print book or ebook. Take advantage of the author’s years of experience producing professional book files for satisfied clients. Her tips and tricks to mastering the technical details of publishing a book are presented in a simple, step-by-step format that anyone can understand. With a well-written book, a good marketing plan, and this how-to manual, you can make your self publishing dreams come true. What is stopping you? Get started today! If you would like to apply advanced Kindle formatting to your book, please note that this how-to manual does not cover the use of CSS, html, KindleGen, NCX files, or other advanced Kindle formatting issues. If this area is of interest to you, the purchase of a separate book covering these topics is recommended. As well, this manual is best suited for fiction novels, or general nonfiction books. If your nonfiction book requires a great deal of specialized formatting, you may consider using a professional page layout program, such as Adobe InDesign. The use of InDesign is not covered in this book.